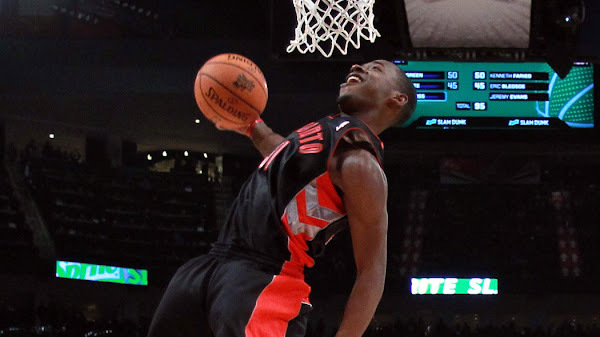 The 2013 Sprint Slam Dunk Contest winner is Terrence Ross of the Toronto Raptors. The Eastern Conference was represented by Gerald Green of the Indiana Pacers, James White of the New York Knicks and Ross. The Western Conference was represented by Kenneth Faried of the Denver Nuggets, Eric Bledsoe of the Los Angeles Clippers and Jeremy Evans of the Utah Jazz. The West squad took home gold in the team portion of the program, edging out the East, 268-258. Both Green and Ross notched perfect scores (50) on their first dunk. Green's dunk came off a feed from his teammate off the side of the backboard that finished with a reverse jam. Ross' dunk was just as impressive as Green's after the Raptors guard completed a behind-the-back 180 degree jam. Faried and Bledsoe had the best dunks for the West in the first round. Faried was able to complete his off-the-backboard under-the-legs jam, while Bledsoe bounced the ball high into the air, grabbed it and did a twisting 180 degree slam. Both dunks rightfully resulted in a perfect score of 50. Because he compiled more total points than his other two teammates, Evans made a repeat appearance in the finals against newcomer Ross. Evans started off the championship round by leaping over a covered painting on an easel. After clearing the painting and completing a windmill jam, he unveiled a picture of him doing the dunk he just finished. Ross followed that up by receiving a feed from his teammate off the side of the backboard and went on to finish with a windmill, 180-degree jam. On top of that, he sported a Vince Carter Raptors jersey. Evans' second dunk came off a feed from a seated helper who threw the ball in mid-air, and Evans would jump over his set up man, doing his best "Jump Man" impression en route to finishing strong. Ross overshadowed that dunk with the help of a youngster who was sitting courtside. The Raptors guard jumped over the ball boy and finished with an under-the-legs slam that had the whole crowd going nuts. In the end, Ross' final dunk was the one that left everyone talking, and it was good enough to win him the Sprite Slam Dunk Contest.